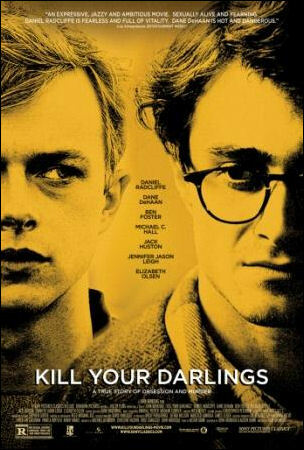 Kill Your Darlings is the true story of Columbia University students Allen Ginsberg (Daniel Radcliffe), Lucien Carr (Dane DeHaan), Jack Kerouac (Jack Huston) and William Burroughs’ (Ben Foster) involvement in the murder of David Kammerer (Michael C. Hall). In 1944, the young Ginsberg develops a friendship with the very charismatic Carr whose troubled past follows him to New York City. Carr takes Ginsberg under his wings and breathes new life into him showing him things he has never seen before and introduces him to a new class of people, some of which end up being part of the famous beat generation. Only, Ginsberg and Carr’s friendship is tested when Carr is arrested for the murder of Kammerer. The film is well-shot and interesting to watch, but it’s a little too artsy for a biopic, making me question how much of the story holds true and which parts are derived from the director’s overactive imagination. Kill Your Darlings is a Sony Pictures Classics film and is currently playing in select theaters in New York and Los Angeles.